A garden of flowers planted in used tear gas grenades memorializes Bassem Abu Rahmah, killed by Israeli forces in 2009 in Bil’in. But recent AP photo coverage looks mostly at the flowers and misses the memorial. The act is one of both peaceful resistance and an answer to the controversial separation wall erected by the State of Israel. Residents of Bilin village have created an oasis in the desert landscape of the West Bank, and planted flowers in tear gas canisters which were fired at protesters by Israeli forces. 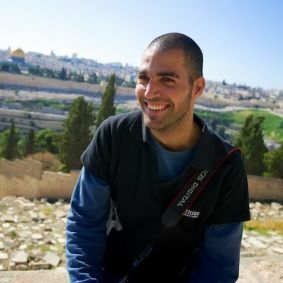 Bassem Abu Rahma, a protest leader, was killed in 2009 when Israeli forces shot him in the chest with a tear gas grenade. The garden was created in his memory and in the memory of other victims of the Palestinians’ fight for their land. The eclectic potted plants also mark the land that Palestine reclaimed two years ago through a protracted court battle that re-routed Israel’s wall. However, the key context of the garden was missing from the captions in a widely circulated Associated Press photo story. For example, photo captions identified only “A Palestinian woman” watering the garden, failing to mention that it was Sabiha Abu Rahmah, Bassem’s mother. Nor did any of the AP photos include the centerpiece of the garden. On Ynet’s version, not only is there no mention of the Abu Rahmah deaths as the reason for the memorial garden, but their concluding sentence further obfuscates the price of Bilin’s resistance: “Every Friday, Palestinian and Israeli leftist activists come to protest the separation fence at the site, and several of these demonstrations have ended in injuries.” Who injures whom and how badly is left to the reader’s imagination. The Israeli regime began building the separation wall in 2002, and the route has been the target of regular protest rallies waged by residents of various towns whose land has been cut off by the barrier. Despite the protests, Israel insists on keeping Palestinians out. What many outside the Palestinian community misunderstand is how the Israeli government has effectively confiscated large plots of Palestinian land in order to erect the barrier. When the 435-mile barrier will be complete, 85 percent of it will have been built inside the West Bank, rather than on the internationally recognized Green Line between the State of Israel and the occupied Palestinian territories. The result is that the wall does not simply divide “Israel from the West Bank” as is often stated, but rather Palestinian land from Palestinian land, dividing farmers from their land, children from schools, and families from each other. Posted on January 25, 2014 April 10, 2016 by rebeccabrindzaPosted in Current Events, English, UncategorizedTagged Bilin, israel, palestinian, peace, yalayoungleaders.